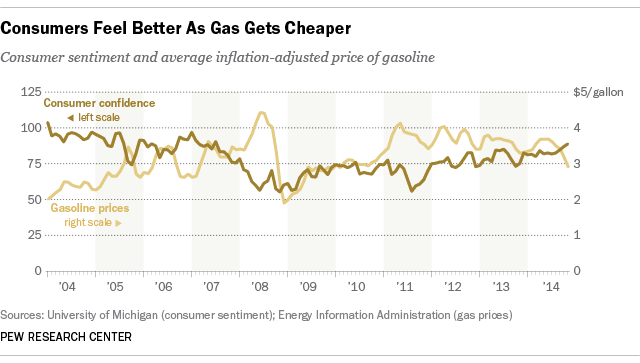 Gasoline prices have been dropping since midsummer, and consumers’ confidence about the economy has been on the rise. Could there be a connection? According to a new Pew Research Center report, 70% of Americans now report hearing mostly good news about gas prices, up from just 15% in August. In truth, gas prices have been falling for months: As of Monday, the national average price of a gallon of self-serve regular was $2.554 — $1.15 less than in late June (representing a nearly one-third drop), according to the U.S. Energy Information Administration. That’s the cheapest gas has been since October 2009. Also, Brent crude oil has fallen more than $45 a barrel since June and is now below $59 a barrel for the first time since May 2009. Meanwhile, the University of Michigan’s Index of Consumer Sentiment stood at 88.8 in November, up 7 points since July and its highest reading since mid-2007. The preliminary December reading is even higher, at 93.8, though that’s still subject to revision. We plotted the monthly consumer-sentiment index against the monthly average price of regular gas (adjusted for inflation) and found a moderately strong negative correlation — that is, consumer sentiment rose as pump prices fell. That aligns with previous research: For example, a 2012 paper from two researchers at Loyola University Maryland and the University of Maryland Baltimore County not only found an inverse correlation between gas prices and consumer sentiment, but used causality testing to conclude that price changes predicted sentiment changes and not the other way around. Those attitudinal changes have real-world consequences, though not large ones. The authors of the JME paper, Paul Edelstein and Lutz Kilian, concentrated mainly on unexpected increases, rather than drops, in energy prices; they estimated that a one-time, 1% increase in energy prices was associated with a 0.08% fall in total real consumption a year later, based on 1988-2006 data. But that was considerably less than the 0.30% decline seen in the 1970-1987 data; energy price shocks, they concluded, have less effect on the overall economy than they used to.